I'm always hesitant to name a “favorite” movie. There are so many films I enjoy a great deal for different reasons, even when the question gets narrowed down to a particular genre, that I simply don't have a definitive answer. Hypothetically, though, if some disfigured madman back from the grave had constructed a devious deathtrap and placed me in it, my only hope for escape being to give an honest answer to this question since any hint of a lie would set off the trap and kill me instantly, I think I could survive by saying THE ABOMINABLE DR. PHIBES. 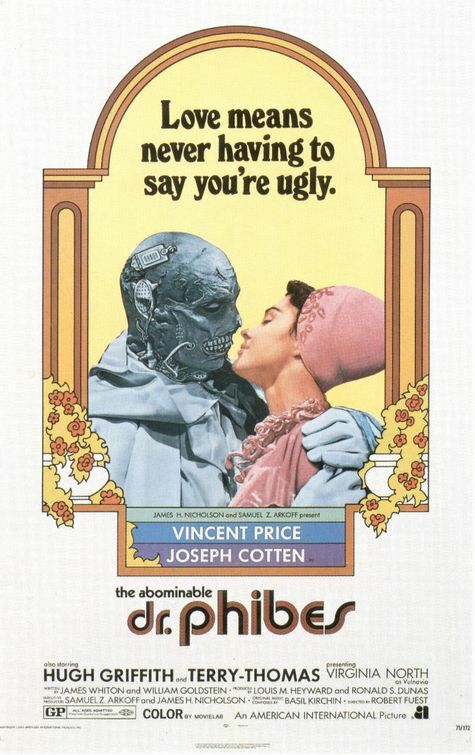 PHIBES is one of a small handful of movies I feel compelled to revisit at least once a year. It's not because I think it's the best movie ever made, or even the best horror movie ever made, but there are few films, horror or otherwise, as much fun to watch. Set in 1925 England, the film begins with Dr. Anton Phibes (Vincent Price) sitting at his majestic organ clad in a black hooded cloak. As he plays, the organ rises into an art deco wonderland populated by mechanical musicians (Dr. Phibes' “Clockwork Wizards”, as the name on their bass drum head informs us). Then through a splendidly decorated doorway a brilliant light shines, heralding the arrival of the exotic beauty Vulnavia (Virginia North). As the Clockwork Wizards strike up a tune, Phibes and Vulnavia take time out for a dance before heading out into the night for the first of their carefully planned and highly unusual murders, this one involving bats. The victim, a prominent doctor, is discovered the next morning by his butler. The police are called in and Inspector Trout (Peter Jeffrey) arrives on the scene. He is utterly baffled to find a room full of furry flying mammals that ought to be in South America, not England. After two more physicians die in bizarre ways, Trout finally starts to put the clues together. He discovers that all the murdered men worked with a Dr. Vesalius (Joseph Cotton), and thanks to an amulet left behind at the scene of the most recent crime, it becomes apparent that the murders are being staged in such a way as to represent the 10 plagues visited by God upon the Pharaohs in the Old Testament. From there Trout figures out who the remaining victims will be, but can he reach them in time to save them from the vengeful Phibes? When listing off the things that make this film so much fun, one has to begin with Price himself. The majority of his performance here is pantomime, his character having suffered horrible injuries in a car crash that left him mute and disfigured, much of his face painstakingly recreated in unmoving wax. Phibes occasionally “talks” in a slow, halting monotone using a clever device that allows him to plug a gramophone into his neck, but for the most part his actions speak louder than words. One might think that an actor so closely associated with his voice would be hampered by these restrictions, but Price conveys everything he needs to with the slight raise of an eyebrow or tilt of the head, imbuing these slight movements with his trademark mix of macabre mirth and menace. Like all the best monsters, Phibes manages to elicit our sympathy even as he does horrible things. He may be absolutely off his rocker insane, and his campaign of murder wholly unjustified, but he sincerely believes himself to be the wronged party and commits his acts of evil out of love for his deceased wife. At the same time, all the victims come off as arrogant and unlikeable, and the police are all utterly incompetent. It's almost impossible not to root for Phibes. Of all the film's would-be “heroes”, only Joseph Cotton's Dr. Vesalius comes close to getting the audience on his side. THE ABOMINABLE DR. PHIBES doesn't so much “hold up” over time as exist outside of it. It truly does create its own world, drawn partly from French pulp stories like Gaston Leroux's Phantom of the Opera and Marcell Allain and Pierre Souvestre's Fantomas, but filtered through the imagination of director Robert Feust, who was responsible for the film's darkly comic tone. He also had a background in set design and collaborated with credited set designer Brian Eatwell to give the film its truly distinctive look. The result is a film world that bears almost no resemblance to any reality past or present. In fact everything about this movie seems designed to create a feeling of unabashed fantasy, anathema to those who believe movies are always supposed to be realistic. It's their loss. Note: pretty much all of the background/behind the scenes information that informs this article came from The Irreplaceable Mr. Fuest by Justin Humphreys in Video Watchdog #168. I found a great appreciation of PHIBES in "How to Wreck a Nice Beach," a quirky book on voice-synthesizers in music, war and culture. A couple of pioneer hip-hop dudes say that because Phibes connects his ruined larynx to a turntable to speak, he can be considered hip-hop. In fact, maybe his name is code for "Dr. Vibes." ...But why didn't the Clockwork Wizards defend the mansion with tommy guns like they were supposed to? Check out the new all-Phibes issue of Little Shoppe of Horrors (#29), Bob. It contains, among other Phibes-related articles, my 30-page making-of article on The Abominable Dr. Phibes. I share your deep affection for the film. Thanks Pettibloggery, I will look for that.